Bjorn Borg attempts to win a fifth consecutive Wimbledon title. In his way is John McEnroe. As I sit down to write this review, I'm still unsure what exactly the official UK title of this particular sports movie is. The press release that accompanied my screening invite referred to the film throughout as Borg/McEnroe. The distributor Artificial Eye's UK poster reads Borg Vs McEnroe. 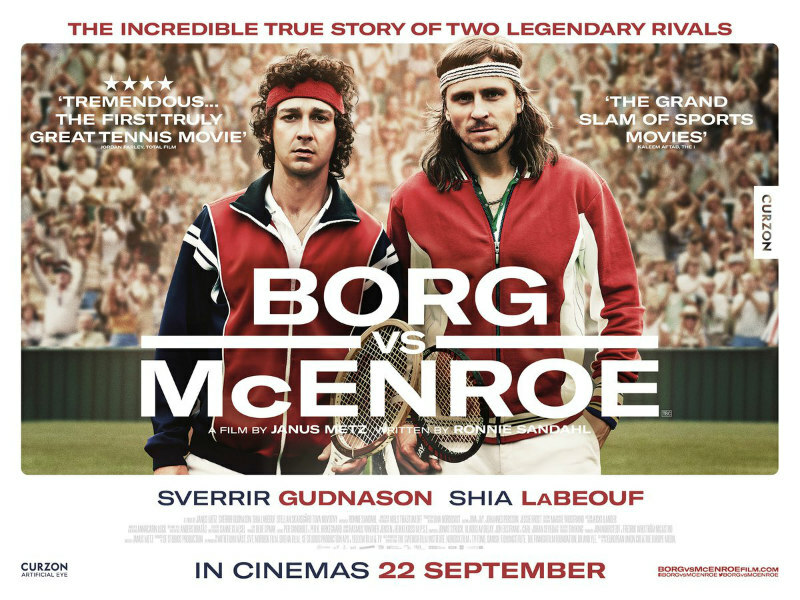 The confusion is added to when the film's title card appears, designating it as simply Borg McEnroe. Who knows which title I should refer to director Janus Metz Pedersen's film by, but I'm opting for Borg Vs McEnroe, as given its largely one-sided view of the famous tennis rivalry, it seems the most apt, and it's no surprise to learn the film was released in its native Sweden as simply Borg (a title which may have gotten Star Trek fans prematurely excited). It's 1980, and Sweden's Bjorn Borg (Sverrir Gudnason) is the king of the tennis world, headed for an unprecedented fifth consecutive Wimbledon title. The only man standing in his way is tempestuous Yank John McEnroe (Shia LaBeouf), whose foul-mouthed on-court outbursts have made him the sport's pantomime villain. Also standing in Borg's way is Borg himself. Known for his ice cold composure and machine like lack of emotion on the court, in private Borg is an emotional trainwreck. In flashbacks, Pedersen shows us the Swede as an angry young working class teen, whose lack of discipline makes McEnroe look the picture of professionalism. In contrast with the scientific methods of his coach, former Swedish tennis great Lennart Bergelin (Stellan Skarsgard), Borg's life is governed by superstition. One of the movie's most effective scenes sees Borg break down when a TV documentary brings him back to his childhood home, and he can no longer recall which garage door he once practised his serve against. Though granted considerably less screen time, McEnroe is portrayed as the inverse of Borg, his on court histrionics a contrast to the shy middle class maths wiz we see in his brief flashbacks. The film hints at an uncomfortable relationship between McEnroe and his domineering, perfectionist father, but never really expands upon this. Made primarily for a Swedish audience, and thus fans of Borg, Pederson's film suffers from one major problem - it's a sports movie in which the villain is the underdog and the hero is literally at the top of his game. The movie has to go out of its way to invent obstacles for Borg, most of which are the very definition of 'first world problems', and you may find yourself muttering something along the lines of "Oh, get over yourself Bjorn" at several points. Imagine Rocky if it were told from the point of view of Apollo Creed, and you'll have some idea of how this story plays out. In the final act, Borg Vs McEnroe faces another stumbling block - tennis isn't a sport that lends itself readily to a cinematic interpretation, as the only way to shoot a match in a manner the audience can easily comprehend is from overhead. Chopping the epic and lengthy 1980 Wimbledon final down to an extended yet incomprehensible montage leaves us relying on the scoreboard to keep tabs, and it has more in common with refreshing a livescore app than watching an actual sporting duel. 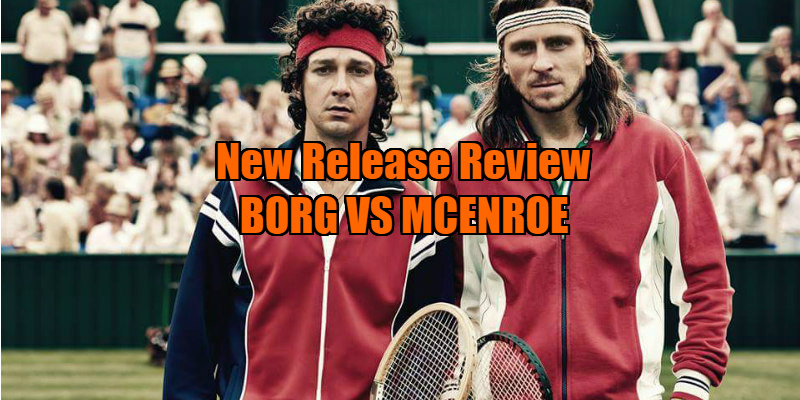 While it's difficult for a neutral viewer to invest in Borg Vs McEnroe the way the film would like you to, it's the film's strong performances that will hold your attention. Gudnason likely won the role due to his uncanny likeness to Borg, but he thoroughly earns his selection, quietly conveying the mental torture the Swede needlessly puts himself through. La Beouf is essentially playing a version of himself - like McEnroe, he's no stranger to controversy and running his mouth off - so it's no surprise that he nails it; if only the movie had given us more of him. Borg Vs McEnroe is in UK/ROI cinemas September 22nd.